Virginia continued to rank near the top, achieving 10th place in the nation for overall child well-being, according to the newly released 2018 KIDS COUNT® Data Book, an annual Annie E. Casey Foundation report that measures child well-being in four domains: economic well-being, education, health, and family and community. Despite this success, the commonwealth stands to lose ground, and billions of dollars along with it, if the 2020 census fails to provide an accurate count of people — especially young children, who are often undercounted at a rate twice as high as any other age group. Currently, Virginia receives nearly $3 billion annually in federal funding to support programs for children and their families. 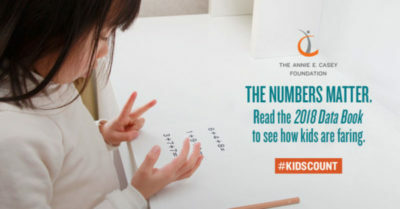 An inaccurate count means fewer federal dollars for state and local programs — like education, school lunches, Head Start, SNAP, and health insurance — that give kids the opportunity for a healthier start in life. The 2020 census, which will determine the commonwealth’s funding for the next decade, is only two years away. To sustain our current gains in child well-being and ensure children are fully considered in policy decisions, we need to lay the groundwork for an accurate count now. The undercount of young children has gotten worse with every census since 2010. In part, accuracy depends on counting children in neighborhoods or families that are historically harder to count. Kids can go uncounted for reasons such as complex living arrangements, high mobility or homelessness, living in mixed immigrant status families, and — as is the case for many kids in Virginia and nationwide — living in high-poverty neighborhoods. In Virginia, 78,000 (15 percent) of young children (ages 0 to 4) live in hard-to-count census tracts. We must do a better job of counting our kids in the census. We can’t measure and track progress in child well-being if we don’t know where or who the children are. For kids to truly count, all of them must be accurately counted. Knowing what’s at stake, organizations and individuals have come together to make the 2020 census a priority in Virginia. Voices for Virginia’s Children is a member of Virginia Counts, a statewide coalition coordinated by the Virginia Civic Engagement Table. The coalition is currently developing a set of priorities and recommendations to ensure a proper count of all people in the 2020 census. • 13th in economic well-being: Virginia continues to lag behind the nation in the rate at which it is reducing child poverty. While nearby states continue to improve in rank, the commonwealth is facing child poverty at a rate that is on par with 2010 levels; more than 260,000 kids (14 percent) are living below the poverty line. • 6th in education: In recent years we have seen steady gains in the number of students graduating from high school, putting the commonwealth ahead of the national average with 87 percent of students graduating on time. • 14th in health: With only 5 percent of children uninsured, health insurance coverage continues to be a bright spot in the commonwealth after experiencing a 29 percent drop since just 2010. • 13th in the family and community domain: Teen birth rates are at an all-time low nationwide, and Virginia has seen an 41 percent decrease since 2010 in the rate of births to teens ages 15 to 19 (16 births per 1,000 in 2016), ranking 11th on this indicator within the family and community domain. To learn more about the 2018 KIDS COUNT® Data Book and see the Virginia KIDS COUNT Profile, please visit Voices’ national data page. Voices’ Press Release: 2018 Virginia KIDS COUNT Release of National Data Book.